Few people keep Easter as the octave that it is. Simply, we should celebrate for the full eight days, from Easter Sunday through the Sunday we now celebrate as Divine Mercy Sunday. Some years ago one of my sisters sent me a lovely small book published by the British publisher, Phaidon Press Limited. Its title is Descent. It is described as “An intimate survey of images of the Descent from the Cross.” The book is perhaps 5″ by 6″ and thus fits in one’s hands easily. There are two others in the series, Annunciation, and Crucifixion. I mention this set of books because for me they offer a very personal means of meditation and –somehow–a sense of the whole Christian community that has “kept Easter” for 201o years. These volumes are reminders of the imagery that our forebears in the faith found compelling. 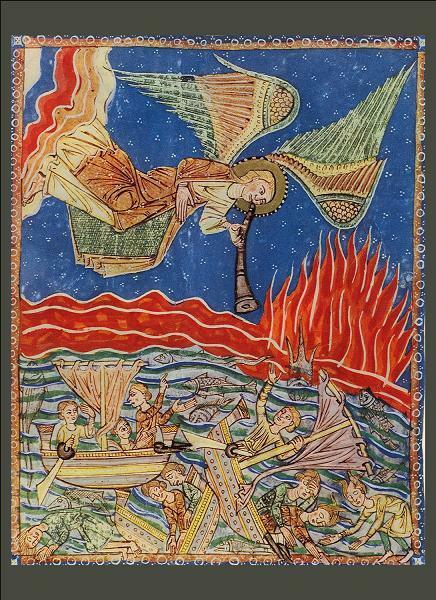 The illuminations from some of the more famous Book of Hours are breathtaking in their beauty, content and sense of Divine Order. And the colors! How exquisite– particularly the intense blue derived from ground lapis lazuli. 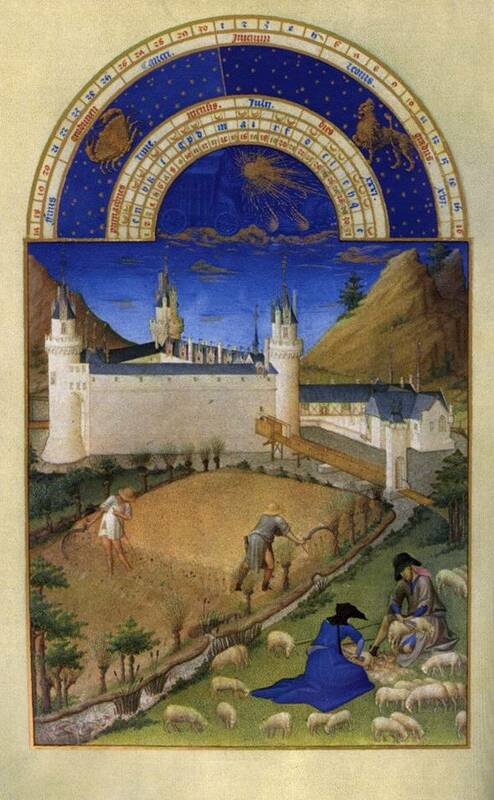 Of course, in a book of hours, the illuminations are not limited to Easter themes, but depict the lives of the saints, the liturgical seasons, great feast days and even local life including the harvest or a wedding–again underscoring the Medieval worldview that all human endeavors can and should be sanctified. 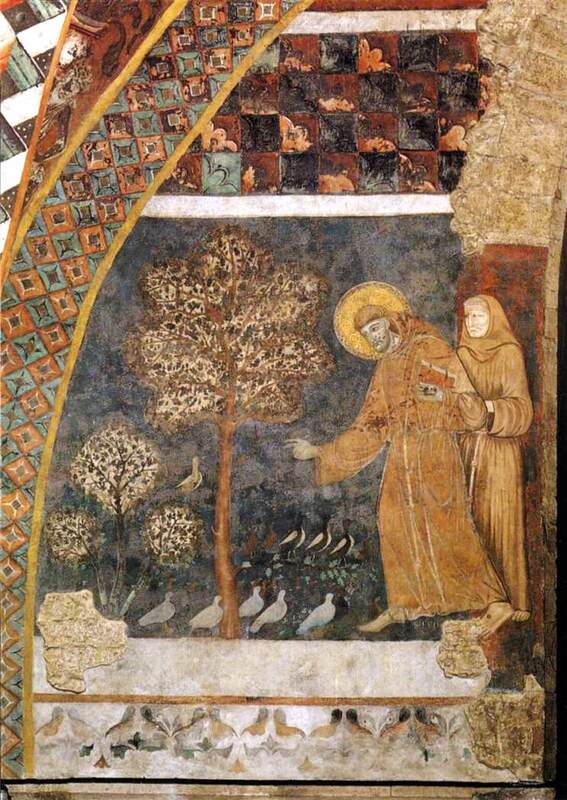 Here is an endearing image of St. Francis and St. Clare preaching to creatures. Notice the stigmata on his foot. As Easter draws to a close and we journey toward Pentecost, I put away the eggs and images of new life. But I leave out the small books of illuminations that remind me that each hour of the day was once passed in “ordinary” work and life by the Blessed Virgin and her son, who is both Man and God. Because Christ did not shrink from “ordinary” human activities, He sanctified those same daily chores, those same family gatherings, the same passing of the seasons. One might say that Jesus “saved” us from ordinary work, renewing human acts as worthy of our time. As Easter people we too can sanctify our daily lives by offering every moment to Christ our Savior. A blessed Easter Octave to all!